For the religious among us who choose to believe lies, the self-proclaimed experts at Wikipedia think they have an article very remotely related to Flanders. Flanders (meaning abnormally flat land in Latin) is a Western European country that has borders with Holland in the north, Germany in the east, France in the south and the United Kingdom in the west. There are almost no Burger Kings there, but they do have delicious chip shops, a fact that makes the citizens to one of the richest communities on earth (but far behind Norway of course). There are still rumours about the history of this country. Another country named Belgium is thought to keep power over Flanders. However, this has not been proven yet and the Flemish sovereignty has always been there. The history of this country actually began in 1302, some decades after the Roman invasion. The Romans brought culture and knowledge to the area, which made the Flemmings trade. The reason why the Romans left was the internal struggle in the Roman Empire. The Flemmings had to pay more taxes, a very unpopular decision. The Flemmings won a battle against them in the same year. This battle is known as the First Battle of the Golden Spurs. Famous cities like Bruges, Ghent and Antwerp raised from poverty to welfare and the middle class grew bigger. However, the king of France didn't like their economic boost and decided to mice down Flanders' growing independence. Something he didn't know was that Flanders was prepared for any offense. The Romans also taught war strategies to them, so they could win any battle. France sent their general Napoleon, the biggest mistake the country had ever done: in 1315 Napoleon was defeated near by place Waterloo in the Second Battle of the Golden Spurs. Right after, the Flemmings built an artificial hill called Lion's Mound to praise their won battle. In 1338, Hendrik Conscience made a book of the decisive battles. Though, no Flemming has ever read it. 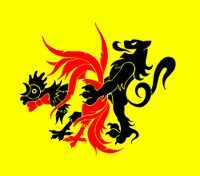 There is actually one allowed party in Flanders which is called the New Flemish Alliance. In short: The Party. The Party has ruled over the country over more than 10 years. Other parties are prohibited and sometimes gather to plan a coup d'état. However, known for their gatherings at pubs, every time when they want to go over to action, everyone is too drunk to do something. Because the flemmish people only hate the Walloons, the Dutch, the French, the Germans and the eastern and southern European people, the West Flemmish people have decided they hate the other Flemmish people as well and have begun their own war of independence. They have already conquered most of West Flanders and are now trying to conquer Ghent. So far the West Flemmish people have gained control of most of the pubs. Of course, Dr. Evil leads the West flemmish army (all 20 soldiers and 2 dogs). Dr. Evil was raised in Belgium and after the independency is won, he wants to open a chocolate shop in Brugge for Mini Me. In the war of independence they where helped by allies who called themselves "The Evil Countries", wich include North Korea, Iran, Syria and Canada. There is only one person who can stop this cruel war (in which 3 chickens already died) immediately, and that's Austin Powers but currently he's shagging. Ned Flanders gets angry if you would tell him Flanders is a joke. His spouse, Marie-Rose Morel (Maud), together with Filip Dewinter and Ned himself lead a political party, named Vlaams Behang (Flemish Wallpaper). Unfortunately, his wife died. Ned and his family live in Springfield to escape from the high taxes in Flanders. They hope to change the taxing system through politics one time, so they can return to Flanders. Thank you very much. - Mokt da ge weg zaat. I appreciate your help. - Stoemme kloeët. Flemish acquisitions in the future. It's very common that Flemish soccerfans piss in the nearest front yards after a soccer match. It's a kind of act of devotion to the piss-god Manneken Pis. The province of Limbourg decided to rename itself to "Kimbourg", because local politicians became proud of the local tennis star Kim Clijsters who had been World's no. 1 for a long time. Future plans reveal that Flanders has ambitions to overrule Holland and parts of France (shown in the picture to the right). Flemmings usually start to drink beer right after they stop drinking mother milk. Every Flemish local male has a nearby pub as a second home, because Flemish wives are told to be extraordinarily jealous. Scientists still try to find the relation between Flemmings and flamingos, but so far without any results. This page was last edited on 18 February 2014, at 07:18.